Optional Diamond cantilever available for $4,000. For decades, the Koetsu sound has been legend in audiophile lore. But only a proud few have owned and experienced the unequaled magic these hand-built cartridges evoke. Many of the converted search out second and third Koetsus. Why? Maybe it's time you hear for yourself. 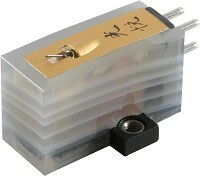 To fully appreciate Koetsu, we must know Yosiaki Sugano, an artist, musician, swordsman, calligrapher, business executive and creator of the world's most renowned phono cartridges. Certainly a well-rounded man, Sugano rose to prominence in one of Japan's largest industrial companies in the postwar years, yet continued to pursue his passions, now including hi-fi.